Ohsweken, Ontario – July 25, 2013 – Ohsweken Speedway’s 18th season of racing continues this Friday, July 26 when McDonald’s of Paris & Brantford present “Christmas in July”, featuring the Corr/Pak Merchandising Sprints, Affordable Towing & Recovery Thunder Stocks, HRW Automotive Mini Stocks, and Gale’s Auto Aftermarket Bombers, plus the rescheduled Autograph Night, and Kids Box Car Races. 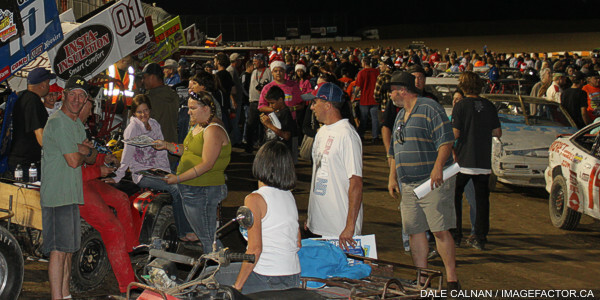 2011 track champion Jim Huppunen continues leads the way in the championship chase for the Sprint Cars. Jamie Collard, Glenn Styres, Mitch Brown, and Shane Ross make up the rest of the top 5. Jim Huppunen and Jamie Collard are tied atop the Brown Auto Service Hard Charger standings, followed by Keith Dempster, Steve Goldner, and Jessica Zemken. The Sprint Cars will complete their postponed B-Main and Feature events from July 19 on Friday, August 23. AFFORDABLE TOWING & RECOVERY THUNDER STOCKS The top 5 has tightened up over the past few weeks in the Thunder Stock division, as Chris Dickie holds an 8 point lead over Lee Winger, with Cory Turner 4 points behind Winger, Mike Thorne 10 points behind Turner, and Jim Lampman 2 points behind Thorne. Dave Silverthorn, Jr. is 8th overall in the Thunder Stock standings, and leads the Rookie of the Year standings, with Karl Sault his nearest challenger. The Thunder Stocks will complete their postponed B-Main and Feature events from July 19 on Friday, August 9. A pair of rookies lead the way for the Mini Stocks. Alex Schuts picked up his 2nd win of the season on July 12, and took over the Mini Stock division points lead as well. Davey Boughton lost the points lead, but he’s still in the hunt, just 7 points behind Schuts. Jason Lungaro, Laura Hughes, and Steve Hess hold spots in the top 5. The Mini Stocks will complete their postponed Feature event from July 19 on Friday, August 30. The Bombers were able to complete their feature race last week before the weather moved in, and Brady Longboat got the win. 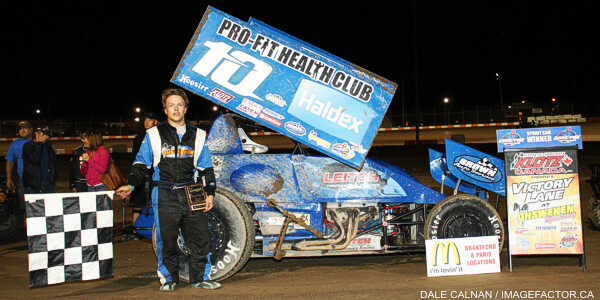 Another change took place at the top of the standings, as Jesse McDonald moved 3 points ahead of Dusty DeBoer. Tim DeBoer, Brady Longboat, and Max Chechalk round out the top 5. The winning 50/50 number from the event on Friday, July 19 has been drawn. The winning ticket number is 227555 on a yellow ticket. The prize of $427.50 can be claimed at Styres Gas Bar. Advanced reserved seat tickets are now on sale for the “Northern Summer Nationals” featuring Tony Stewart on Monday, July 29, the World of Outlaws Sprint Car series “Six Nations Showdown” on Tuesday, July 30, and the 9th annual Canadian Sprint Car Nationals on Friday, September 13, and Saturday, September 14. Please visit www.OhswekenSpeedway.com and check out our new system for online ticket sales, or purchase your tickets at the track on race nights with your Visa, Mastercard, or Debit card! 307 Grand River Street North. Grab a bite to eat on the way to the races, or visit the drive-thru on your way home. Visit www.McDonalds.ca for more information. About Corr/Pak Merchandising: Founded in 1997, Corr/Pak Merchandising Inc. is based in Richmond Hill, Ontario, and is a designer and producer of Point of Purchase (POP) displays for retail. Strong emphasis on creative design and speed of response has seen Corr/Pak achieve great success in a very competitive industry. Their in-house capabilities and broad range of trusted suppliers enable them to develop any sort of effective solution for your retail display needs, no matter the materials used – whether corrugated, wood, boxboard, plastic, wire, steel, or any combination of those. Corr/Pak’s support of the Sprint Car division at Ohsweken continues for a sixth consecutive season in 2013. Please visit www.CorrPak.ca for more information on the title sponsor of Sprint Car racing at Ohsweken Speedway. About HRW Automotive: HRW Automotive was founded by Robert Workman in 1990, and by providing good old-fashioned customer service, HRW has gained a loyal following in the community. Many hundreds of area residents and businesses have come to depend on the expertise of HRW’s friendly staff to keep their vehicles and equipment in peak condition. You can entrust all of your vehicle’s service and repair needs to the team of automotive professionals at HRW Automotive. HRW Automotive is located at 163 Baptist Church Road in Caledonia near the intersection of Pauline Johnson Road, and just 5 miles from Ohsweken Speedway. HRW’s support of Mini Stock racing at Ohsweken continues for a third consecutive season in 2013. Visit the title sponsor of Mini-Stock Racing at Ohsweken Speedway on the web at www.HRWAutomotive.com, or call HRW today at 519-752-2063, and find out what good customer service is all about! Ohsweken Speedway’s 18th season of racing continues this Friday, July 26 when McDonald’s of Paris & Brantford present “Christmas in July”, featuring the Corr/Pak Merchandising Sprints, Affordable Towing & Recovery Thunder Stocks, HRW Automotive Mini Stocks, and Gale’s Auto Aftermarket Bombers, plus the rescheduled Autograph Night, and Kids Box Car Races. Weekly Friday night racing at Ohsweken offers affordable, exciting, family entertainment just a short drive from many Mid-Western Ontario locations. Weekly Friday night racing adult general admission is just $12, while admission for seniors and students is $10, and kids age 12 and under are admitted FREE! Spectator gates open @ 6:00pm, with the first race taking the green flag at 7:30pm this Friday, July 26! Visit the new official Ohsweken Speedway website at www.OhswekenSpeedway.com and Feel The Excitement!